I felt very much relaxed and satisfied after meeting the doctor. He listened to all my problems calmly and politely answered them all. I think half of the problems are resolved and sickness is cured if we meet a good doctor like you. Dr. Manocha at the pain clinic @Max is extremely professional, knowledgeable, co-operative, helpful and patiently and politely answers all our queries. We are very satisfied by his treatment and would definitely recommend him to others. I have had an unmatched experience. Dr. Amod Manocha patiently listened to my symptoms of pain in all the areas of my body viz legs, thigh and arm. It was followed by detailed investigations. After examining the reports and his clinical examination at length, he explained my condition. The treatment advised by him has been followed by me since about 6 weeks after which I feel far better and consider that I have achieved about 80% relief. Such as experience by me is a rarity in our country. 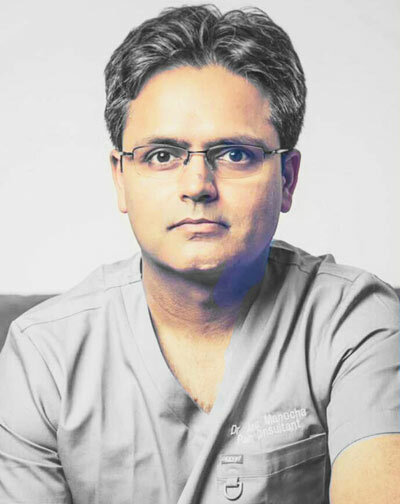 We are thankful to Dr. Amod Manocha for his rich experience and professional approach. Dr. Amod explained my condition very well. His interaction made me comfortable and worry less of my problem. He was one of the best with whom I interacted in a while. I think when I came with my grandmother to Max Hospital, it would have been better for us if we would have started with doctor Manocha. Dr. Manocha, thank you so much. You are really a nice person. Dr. Amod Manocha is extremely cooperative and helps a patient come out of their pain with ease. Thanks to him for listening patiently to my mother and for giving his precious time. Dr. Amod is one of those doctors who treat the patient like a family member. I am really grateful. Dr. Amod listened to all relevant / non relevant details and history to retrieve the faith of patient. Patient is extremely satisfied. Thanks a lot Doctor. Dr. Manocha is an asset to Hospital & Humanity. Most professional doctor I have seen in my entire life; professional to the extent, that he himself arranges all the pre-op equipment in absence of other staff members. Way to go. This doctor is very helpful, supportive and extremely patient. Extremely rewarding interaction with Dr Manocha in every way. I am happy with all explanations about treatment. I am very satisfied with treatment and advice given. I have extreme pain in my left arm arising from post herpetic neuralgia. Under guidance of Dr. Manocha and his team and the treatment given, I am feeling better now and hope to overcome the issue under his treatment. Dr. Amod is a good consultant and he explained everything in detail and good manner. I will approach others also who are having same problem. Thanks to Dr. Amod Manocha ji for patient friendly investigation of pain. Dr. Manocha ji was very honest in explaining the problem and treatment. Very kind, professional. Very patient doctor who knows his craft well. I had satisfactory conversation with the Doctor, he carried out a detailed examination. I like that he has suggested observation for now.